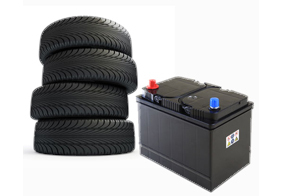 McBryde Oil Company offers a full line of tires and batteries at very competitive prices. As a full service Texas Hill Country company, we carry products from brands you know and trust. Our extensive tire inventory is second to none, stocking major names like Michelin and Bridgestone in a wide range of sizes to fit virtually any car, truck, and trailer. From high performance to heavy duty truck tires, we’ve got your wheels covered. Additionally, we sell a wide assortment of quality truck and auto batteries to suit almost every make and model. Not sure which battery is right for your vehicle? Our expert technicians can help you determine the appropriate size and capacity that works for your car or truck. Our goal is to provide our customers with prompt, friendly service that delivers excellent value beyond their expectations. When you’re in need of reliable tire and battery service in Kerrville, Fredericksburg and beyond, trust the experienced professionals at McBryde Oil Company.